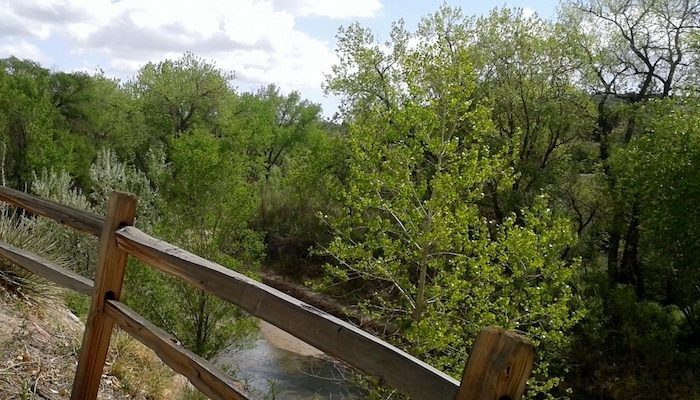 The Pikes Peak Greenway Trail offers over 40 miles of running throughout the city, running primarily along Monument Creek and Fountain creek with dramatic views of Pikes Peak in the distance. We’ve mapped a popular section of the trail, which runs from downtown, starting at the McAllister House Museum, north through Monument Valley Park, near Colorado College, to Boddington Park — a distance of 2.3 miles. The 6 foot wide trail has a mix of asphalt, concrete, crushed stone, and dirt surfaces, but all sections are firm, springy and well-kept. For a longer run, continue north for another 2 miles to the Gossage Sports Complex, or 3.5 more miles, to the intersection with the New Santa Fe Regional Trail. You can also go south along the trail for 2 miles from downtown to Dorchester Park, and intersection with other trails. Note: People experiencing homelessness tend to gather in the park especially during winter.